Life, love and making stuff: Snapshots of August in September!!! When I sat down to write August Snapshots I just felt a whole lot of busy. The diary is scribbled with school activities, soccer training, dance and music lessons, birthday parties. There has been a lot of driving around from a to b to c and then back again. So I closed my diary and went to see what snapshots I caught during August. The things that really matter are usually caught on camera. A new dress and a new do..well a new colour. The Mr started his new job. I began working 3 days a week, which accounts for the feeling of a whole of busy I suppose. I am hoping the warmer weather and longer days ahead will give me a bit more time in the day. A spot of stitching-a new dress for loobylu. She of course LOVES it! Bella made the most delicious crepes with orange sauce from the Masterchef Junior Cookbook. 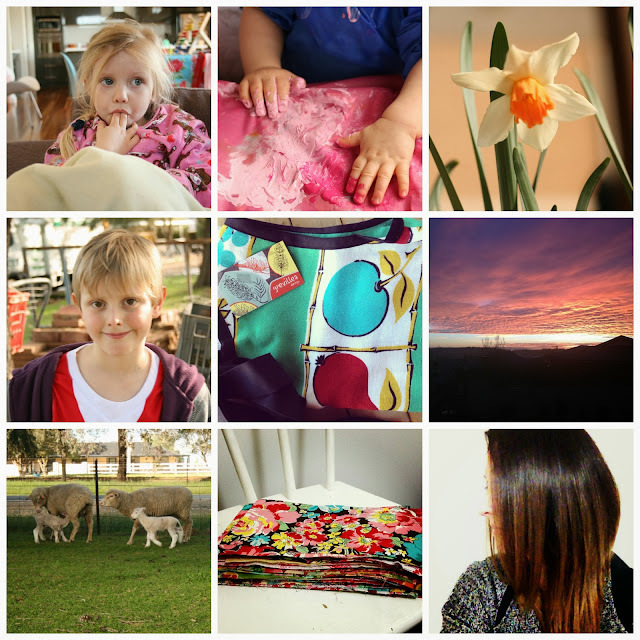 Cross August snapshots off the list! oh how I love lambs!!!! I would love to have cuddled Grammy and Grandy's lambs!